The Reluctant Storyteller: SRA Idol 2013!! 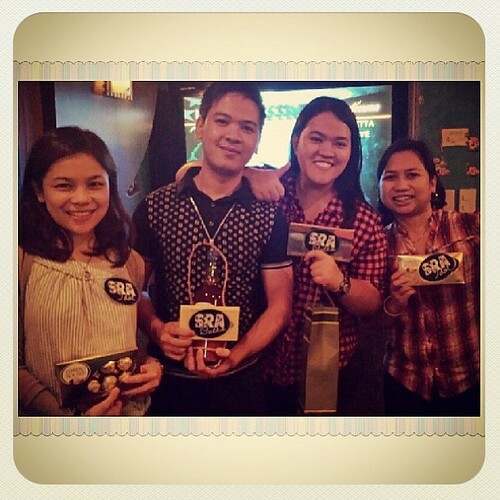 Every year for two years now, SRA holds a mid-year event at a nearby Family KTV. To make things more exciting, our manager made it a (friendly) competition among us members. Hence, the term SRA Idol came to life. 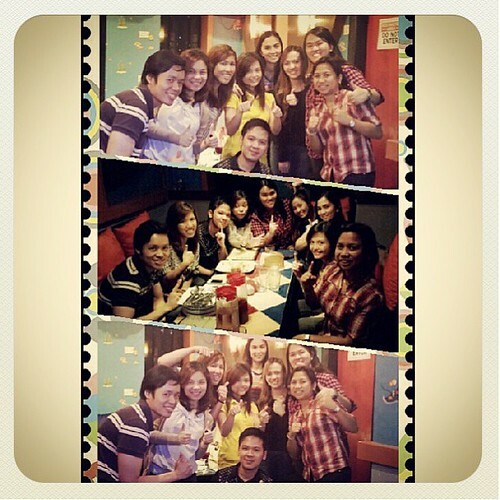 This year, we had it at Music Platinum Family KTV in Polaris St., Makati. I swear, level up talaga ang SRA Idol this year! As in! It's an event that an SRA member really shouldn't miss! I almost did, actually. Since getting hospitalized 2 weeks ago, Mon and I have been taking extra precautions on my pregnancy. No more commuting, no more strenuous activities, no more late night outs. For this year's Idol, I was supposed to join the duet category only then go straight home na. Mon was supposed to fetch me at 7:30pm but the event started at around 7:15 na. Siyempre may mga opening remarks pa and all that so hindi ko na talaga mapapatapos if ever kahit yung first category man lang. So I begged Mon to let me stay. Faith, my manager, offered to take me home naman. I promised hindi ako magpapagod. My teammates were very supportive in that pag nakikita nilang out of control na ako sa tuwa, they remind me to calm down. Yung duet category ang pinaka-aliw sa lahat ng categories. Ang gagaling ng performances! With matching choreography pa talaga. Prepare to be entertained ang peg, especially ang Jun and MG tandem with their winning piece, This Love by Maroon 5. F na F kung F na F! A well-deserved win. Great job, lunchmates! Not-so-close fight naman sa Tagalog Category because may isang nag-stand out talaga. I know kasi it was I who tallied the votes. Faith garnered 50% of the votes that night for her winning piece, Araw Gabi by Regine Velasquez. Go go, Faithee!! As for me, well, I wasn't supposed to join the English Category. As I've said earlier, I was supposed to join Duets lang. Pero nung nakita ko yung prize, aba, Ferrero! Mon loves Ferrero! So I thought, might as well try it out diba! Nandun na rin naman ako eh. So I got the songbook and literally picked the first song I laid my eyes to, A Very Special Love by Sarah Geronimo. Sa totoo lang (walang stir! ), everybody did very well sa performances nila. Ang hirap pumili ng bobotohin during votation time! So congratulations to all of us! We're all winners in our own right! Our tagline: Once an SRA, always an SRA!